3D printing has opened up a vast number of possibilities not just for designers and innovators but also for the regular people. Just think about it, with 3D printing we can create actual objects just at the touch of a button! From healthcare applications where lives could be saved to easing everyday functions of life – the possibilities are endless! Perhaps we will have edible objects that are created using syringes containing actual food. Maybe one day bio-printing will help replicate human tissues and organs. Perhaps one day you and I could create things we need right at home without even having to head to the store! Whereas regular printing prints using ink, 3D printers create objects using plastics or polymers, glass or metal to create objects from a 3D design that are very close to the original object sought to be created, though the functionality may be limited as of now. Just recently, NASA used 3D printing for a powerful rocket engine check. According to Chris Singer, director of the Engineering Directorate at NASA's Marshall Space Flight Center in Huntsville Ala, the successful application of the 3D printed rocket injector helps to bring the organization closer to actually reducing the cost of flight hardware. Amazingly, 3D printing using moon-dust is also currently being worked on. There is a clothing line called N12 Bikini that is created from 3D printing technology. The clothing is made from Nylon 12 and created entirely with the help of 3D printing. The design is created after scanning the body so that the fit is perfect. The ‘fabric’ is created using small connected circles that conform to the shape of the wearer. The applications of 3D printing for healthcare can be many and amazing; even lifesaving. It is possible to use a 3D printer along with other screening protocols to create a model of a tumor so that surgeons know what to expect before they even start to operate. It is also possible that 3D printing could help create artificial organs; for instance, it can help to correct deformed limbs. Medical specialist in Belgium actually created a titanium jawbone for an 83 year old woman using 3D printing. Experts also suggest that the technology could help create new defense systems or weapons so small that they are nearly impossible to detect. 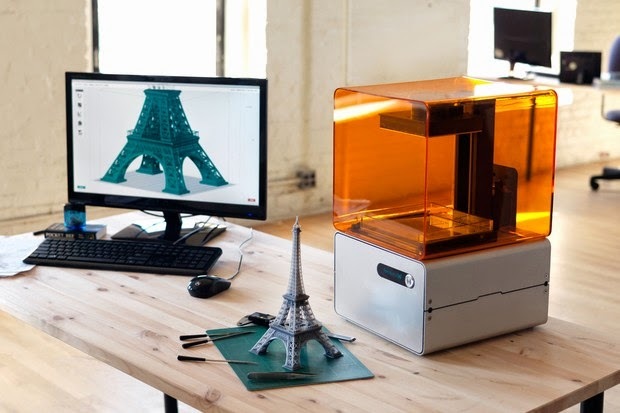 3D printers are fueling the Maker revolution of designers, inventors and creators. With the help of advanced and super-fast prototype creation, the time taken is reduced and the number of prototypes created increases. In short it has become easier for more people to translate an idea into reality; into an actual object. According to experts, 3D printing is set to revolutionize manufacturing processes and could result in dramatic price changes because big supply chains would be rendered redundant. 3D printers are already being used in schools and in future have the potential to turn into even more potent educational tools. 3D modeling tools such as Google Sketchup are already a part of some curriculum. Kids will be learning with the help of advanced 3D objects and also creating them in the very near future. 3D printed components are now being used for different types of transportation. British fighter jets have been flown using components crafted by 3D printing technology. Wing Commander Andy Green used 3D printed components, in this case a titanium steering wheel for the Bloodhound SSC in his bid to break the world land speed record. Car manufacturer Honda has enabled people to print out a concept car prototype – 3D printable models of the car are available at the website Thingiverse is the place to head to, if you want to learn and see more of the 3D printing community. This is a community that encourages people to make and remix 3D things, helping others discover, create, participate, and share. In the foreseeable future, 3D printers will be a part of our everyday lives; experts predict that this will be a major technological driving force in the future. 3D printed art, and 3D printed meat are already a reality. The amazing world of 3D technology keeps evolving by the minute. Keep yourself informed of what else could become our reality in days to come. Be sure subscribe to our mailing list or follow us on Facebook, for amazing discount offers on ink & toner.